It was April Fools’ Day. I was reading a chart from Business Insider with the bold title “The Mobile Web Is Dead, It's All About Apps” and I thought for sure they were messing with me. I pondered…Are they messing with me on purpose? Are they taunting me? But then I remembered that it’s Business Insider and nearly of their charts are terrible. I studied the chart for a few minutes before I even noticed that there was the black ring around the donut that summarized the slices of the donuts. Whoa, that’s confusing! And besides, who would ever slice up a tasty donut? I re-created the data in Excel (get it here) and created this version with Tableau for Mac. Notice that I kept the bars at scale across Apps and Browsers; this helps to emphasize how little time people spend on mobile browsers. And if you look at social apps, you can see that people spend way more time on Facebook than Twitter. I’m just sayin’! Download the workbook here (requires Tableau 8.2). Much better the donut… this is about proportions. With bars there's no visual representation of total apps versus total browsers. Also, categories structure are basically lost (very difficult to read). The donut does not work simply because there are too many slices. As for a pie, this makes quantities hard to compare, makes labelling cluttered, and makes the use of color difficult. Andy's basic approach is right. How to improve the color encoding for categories? The bars could be re-ordered by category, which would reinforce the color codes. Alternately, the labels could be changed along the lines of "social messaging (Facebook)". 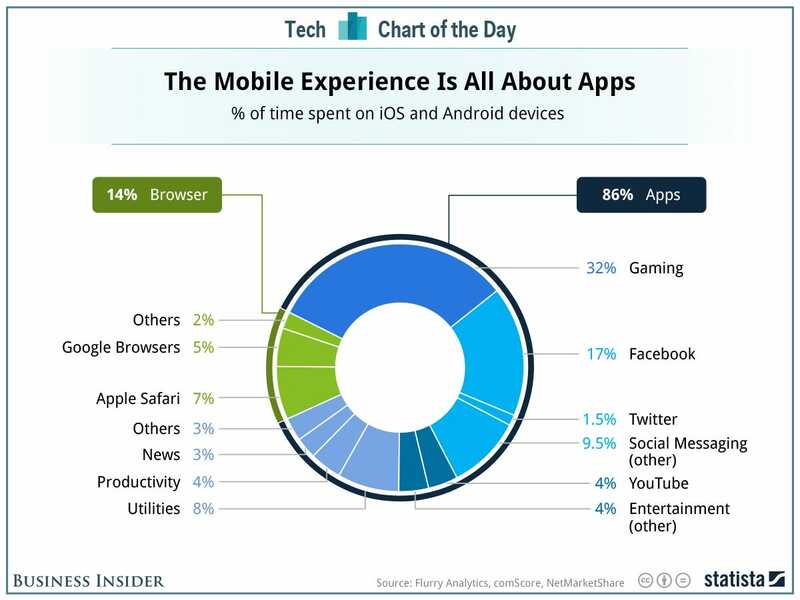 The one thing you compromise when you break out the bars into separate charts is the emphasis on the difference between Apps vs. Browsers (86% vs 14%). Since this is the big headline of the story, I'd hesitate to de-emphasize it, even _ever_ so slightly as you've done with the separate bar charts. I threw together another alternative - it compromises (slightly) on the type labels (I'm not that fond of mixing the % with the type name), but it it highlights the crushing difference between apps & browsers. By the way, I've been fighting the good fight on pie charts - the one thing people seem to hold on to is that they do an OK job of emphasizing _major_ differences when there are only 2 or 3 big categories (e.g. look at how small the Browser slice is compared to the App slice). I recently had to make the case that bars were a better way of distinguishing relative sizes of 2 major categories (bubble charts & tree maps are also choices I would go to before succumbing to Pie). Interesting alternative, Steve. Thanks for sharing!